During the last few weeks, I’ve been spending a lot of my time sewing. The simple wristlet pictured below is my latest design. I hope you like it as much as I do. The top half of this wristlet folds over and has a button closure. The inside edge folds over, too, keeping the contents of the bag secure. I’ve made the inside edge a semi circle so its simple to get the contents out. The fabric for this one is my own creation. With some help from Photoshop and Spoonflower, I’ve been able to create a print fabric from this photo that I took last summer in the garden. I’m making a collection of this style bag and a card case that fits inside the bag with a variety of both new and re-purposed fabrics. Each bag is fully lined with a coordinating fabric. The bag measures 5 inches by 5 inches when closed and is 2 inches deep. It’s the perfect size for carrying a cell phone or camera along with ID, cash, and cards. The key chain and clip are attached and I’ve added a brass butterfly charm to the key chain. 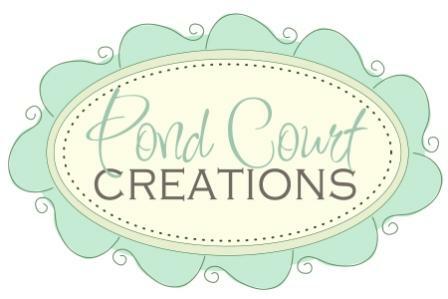 Look for Pond Court Creations on Etsy in the next month. If you discover Pond Court Creations from this post, please let me know and I’ll have a special discount for you.